The holiday season presents a unique chance for you to visit with a senior loved one and spend some good quality time together – something that can be difficult during the rest of the year. Additionally, it is a very good time to be sure that your senior loved one’s holiday is safe in addition to being merry. Whether your senior loved one is enjoying the season in your household or his or her own, taking into consideration these safety tips can assure that everyone’s holiday is joyful and bright. Use very simple decorations that don’t cause clutter. Always make certain that there is sufficient space to walk. Keep extension cords out of the way of walking areas to prevent stumbling over them. Remove candles and replace with bright centerpieces of flowers or fruit, or consider using battery-powered candles. Be certain that all locations are sufficiently lit. Subdued holiday lights can mask fall dangers and make it tough to see around furniture. Add a nightlight in the bedroom and bathroom your loved one will be using and make sure light switches are easy to access. Rearrange furniture so everyone can easily move around it. Put non-slip pads underneath rugs. Keep boisterous pets from running around while the senior is moving throughout the home. Assign a special out-of-the-way spot for kids to play with their new toys while the older person is visiting. It’s vital to acknowledge the special care needs of seniors during the holiday season in order to make their home, or visits to your home, fun and safe. 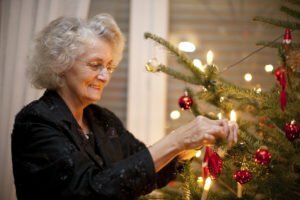 If you’d like more holiday safety tips for seniors, or help with any other in-home senior care needs, contact the California senior care experts at Hired Hands Homecare. We can provide an in-home safety evaluation to assure the home is as safe as can be for your senior loved one, suggest adaptations, and provide a full range of care services. You can reach us any time through our online form or by calling (866) 940-4343.